IQS Directory provides a comprehensive list of plastic fastener manufacturers and suppliers. Use our website to review and source top plastic fastener manufacturers with roll over ads and detailed product descriptions. Find plastic fastener companies that can design, engineer, and manufacture plastic fasteners to your companies specifications. Then contact the plastic fastener companies through our quick and easy request for quote form. Website links, company profile, locations, phone, product videos and product information is provided for each company. Access customer reviews and keep up to date with product new articles. Whether you are looking for manufacturers of plastic fastener clips, plastic snap fasteners, automotive plastic fasteners, or customized plastic fastener of every type, this is the resource for you. We treat each and every one of our customers like they are number one! We have been around for over four decades and we have learned a thing or two during that time. Our company has learned that bringing exceptional customer service, mixed with the best products in the industry are two key components of creating one hundred percent customer satisfaction. To learn more about how we may satisfy you and fulfill all of your plastic fastener needs email us today or visit our website! Founded in 1984, Advance Fasteners is a growing distributor supplying all your fastener needs. Check out our comprehensive range of industrial fasteners and supplies. We have tens of thousands of items readily available for the manufacturing and construction sectors. Quickly & easily search our website. Knapp Fasteners manufactures industrial fasteners, special fasteners, plastic fasteners, electronic and cold headed fasteners. Offerings exceed 500,000 line items with immediate delivery. We provide competitive prices, superior quality and customer service--all for you. With us there is no such thing as a job that is too small or too large for us to handle. 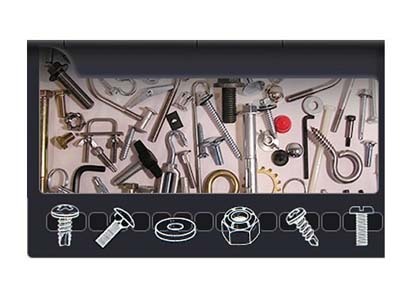 We provide fasteners just the way you need them. We are able to engineer any fastener to fit your exact specifications. For more information, call or visit our website today! As a provider of custom solutions to inventory problems, Infinity Fasteners supplies our customers with a full line of metric fasteners and industrial fasteners. We offer complete lot traceability, emailed same-day shipping information, special packaging and other industrial fastener services. Plastic fasteners are screws, bolts and other plastic tools used to join and secure materials together. Plastic fasteners, despite their comparative lower strength, are a popular alternative to traditional metal fasteners in some situations. Common components of children's toys, plastic fasteners are also used to help make appliances and automobiles. Plastic fasteners offer the benefits of being durable, economical, efficient and aesthetically appealing. They are available in a wide range of colors and sizes. Fasteners constructed from plastic also offer the advantage of being resistant to corrosion, shock and vibration. Plastic fasteners are available in different plastic materials, fastener head types, colors and panel ranges. Though plastic fasteners have gained in popularity in a number of industrial, commercial and consumer products contexts, they remain unsuitable for use in many applications. Aerospace fasteners, for example, are often constructed of titanium because of the tremendous stress that they are expected to endure, particularly in the case of aircraft structural fasteners. Automotive fasteners are also made of metal, usually steel or stainless steel, with the exception of fasteners used to secure upholstery or other non-structural components. Plastic fasteners can be broken down into two main types: threaded industrial fasteners and non-threaded industrial fasteners. Threaded plastic fasteners, such as nuts, bolts and screws, contain spiral ridges called threads, which aid in the fastener's attachment. 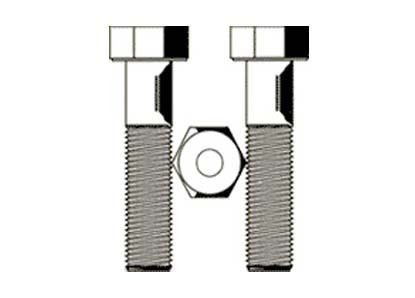 Continuous-thread studs, with two nuts applied and threading from end to end, are often used for flange bolting. Tap-end studs, in contrast, have a short thread on one end, used for screwing into a tapped hole, and a longer thread on the other. This longer end, called a nut-end, may have either a chamfered or round point. Double-end studs, another type of threaded plastic fasteners, have equal-length threads on both ends with chamfered points. This type is primarily used for flange bolting or other applications in which torching from both ends is necessary. Non-threaded plastic fasteners, such as rivet plastic fasteners, ring plastic fasteners and pin plastic fasteners, do not contain threads. These plastic fasteners can be quickly assembled and removed from components and do not need extra plastic fastening hardware. Bind plastic fastener rivets, or pop plastic fastener rivets, are inserted into a pre-drilled hole and a rivet gun pulls on a headed-shaft that passes through the rivet. The shaft breaks or "pops," leaving a bulge on the head of the rivet, which holds the two parts together. Dowel pins can be straight, tapered, rolled or grooved and provide perfect alignment, holding parts in absolute relation to one another. Most retaining rings need a groove to seal them into position and are stamped both internally and externally. While some of them may be self-locking, both kinds are used to keep parts from slipping or sliding apart. Plastic Fasteners - KD Fasteners, Inc.